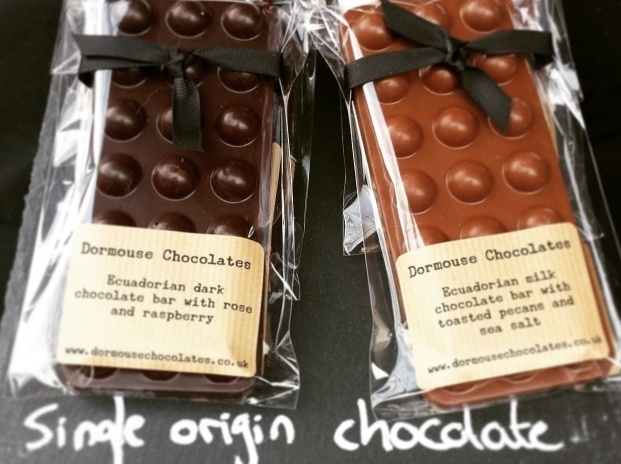 Don’t get the wrong end of the stick – Dormouse Chocolates is not a new recipe I dreamt up as a means of adding a cocoa content to Apicius’s classic stuffed rodent recipe, as documented in his eponymous Roman cookbook. Nor does it refer to novelty mice moulded from cheap couverture. Nope: it’s actually the rather unlikely brand name of a Manchester-based bean-to-bar chocolate company. Founder Isobel is a trained chocolatier with a skillful mastery of her materials and an eye for quirky design. Her silk-smooth, full-flavoured chocolate is variously moulded into Lego-like bars or imprinted with feather patterns; easy on the eye and excellent in the eating. 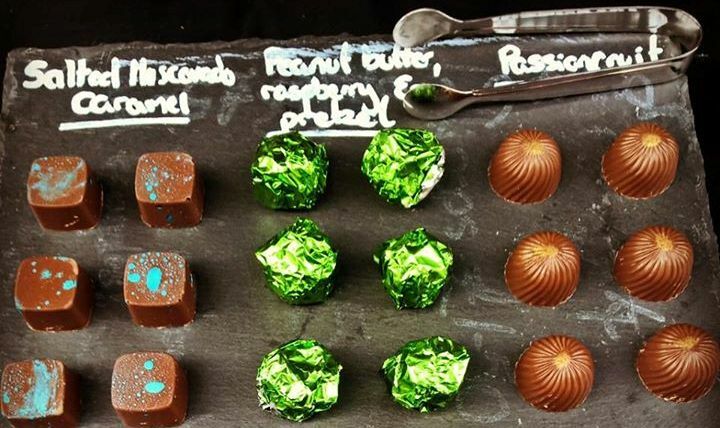 Truffles are as interesting, with past and present flavours in the ever-evolving range including gin & violet, peanut butter, raspberry & crushed pretzel, craft beer caramels, and cherry & pecan discs. Two Dormouse-s turn up on my doorstep looking for a home, and I’m only too pleased to welcome them in. The bigger and bolder of the single origin pair is the 76.4% Dark Grenada; a glossy brunette bar with killer curves that, to me, is all smoke-tinged coffee with a teasing hint of ripe tropical fruit. The Columbian is a slender, feather-engraved 70% number with bags of personality, sharing its earthy, incense-filled-temple taste with Hotel Chocolat’s Trinidad bar and delivering a vibrant, bright burst of intense raisin juiciness. It’s as full-bodied and velvety as Guinness, and like that tipple, boasts a pleasant, lingering bitterness. It’s good stuff, and you really should get your claws on your own Dormouse. The company is based at Manchester’s Wonder Inn, and appears at local farmers markets and events; if you can’t get there in person, you can also buy online. It’s worth noting that Isobel is keen to team up with local producers for creative chocolate collaborations – I predict some deliciously-innovative new products from this little company with a very big future. Doble & Bignall’s beautiful bird illustrations would be more at home in vintage ornithology books than on chocolate boxes – and the duo’s bars are even named for various species; Owl, Cuckoo and Raven amongst their number. 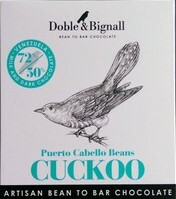 After less than a year in business, Bronze Academy of Chocolate awards for the Johe ‘Raven’ and Puerto Cabello ‘Tawny Owl’ provided much-deserved wind beneath the wings of co-founders Simon Doble and Margie Bignall. Expect D&B to spread its wings and soar to dizzy new heights as the range grows. Spouses Matt and Ish love cocoa as much as they do one another – so much, in fact, they founded Edinburgh-based Ocelot Chocolate. The company is committed to employing ethical practices, and to creating not only delicious chocolate but also bespoke packaging bearing self-penned artwork. 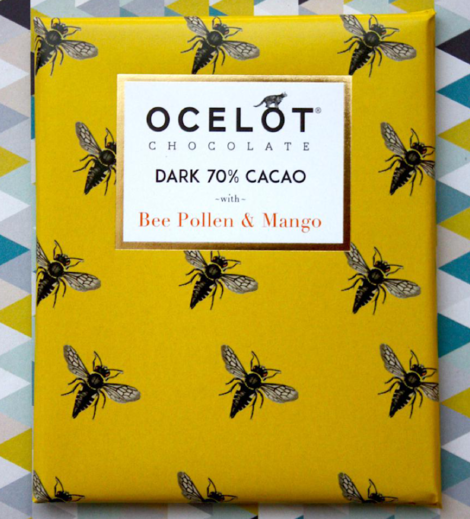 Interesting flavours include Bee Pollen & Mango, and rare-origin couverture comes from Peru and Eastern Congo, with one tree planted for every 100g of the chocolate sold. There’s an awful lot to like about Ocelot. ‘Bee Bars’ is a fitting moniker for these beautiful, botanical treats. 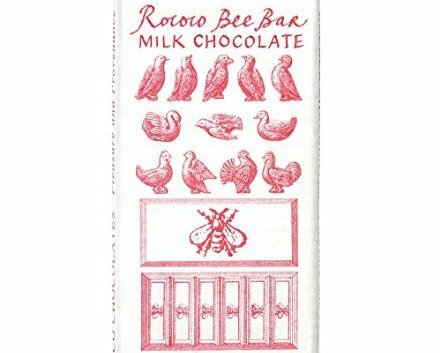 As is typical of Rococo, the illustrated paper wrappers are exceptionally easy on the eye; and each piece is embossed with the eponymous insect. After a single nibble you’ll find yourself well and truly bitten by the bug, so it’s worth investing in a fair few of the 20g treats. Make a beeline not only for the Milk Chocolate Honeycomb Crunch, but also gorgeous floral-flavoured Bee Bars including Rose, Violet, Jasmine, and Orange & Geranium. This is great news. I have to try and find them.